Until this week, I swore that we never got sick if we took elderberry daily. It really does work well as an immunity booster for our family, but a couple late nights and cold season combined, my daughter came down with the sniffles despite my purple concoction. Anyway, my son and I haven’t gotten sick, which I think still shows that elderberry does something! We were using elderberry syrup, but I went ahead and simplified the recipe and turned it into gummies to easily get a serving in each day. The syrup is good, the kids love the gummies though, and they can double as bribes when needed. I keep them in the fridge, these don’t have as much gelatin in them as other gummie recipes, they’re more like a very firm gelatin than a fruit snack. Easy for little mouths to chew. Some notes: Honey is not recommended for children under 1 year of age due to the very small risk of botulism. Nursing mothers may wish to take these to boost their own immunity, but would want to speak with a trusted healthcare professional first. Check with your healthcare professional before using any herbs or supplements. I’m not a medical professional, I’m a mom. This works for me and my family, but not everyone. Make a tea out of the elderberries: Bring water to a boil, then add elderberries and simmer for 5 minutes, or until dark in color. Drain, reserving the liquid. You should have about 2 cups. Add in honey and vanilla and allow to cool. Stir in gelatin (it’s easier to stir into room temp liquid) until all clumps are out and mixture is uniform. Heat in a saucepan over medium-low until gelatin is all dissolved. Pour into a glass container to set. Cut into approx 1/2 inch by 1 inch cubes, or as desired. Take one or more daily, as desired. ** PS, the sniffles were really mild, we hit them hard with Plant Therapy’s Germ Fighter and Respir-aid roll on and they were gone within a week – I strongly dislike getting sick! Have you tried adding probiotics (either powder or via kefir or yogurt) to your gummies? I’m excited to try gummies as a way to get gelatin into my family, but I’m also looking for picky-little-kid-friendly ways to slip in probiotics as well. I haven’t, but I do open the probiotic capsule and mix it into food for my kids. I sprinkle Probiotics on top of food that isn’t warm, LO has no idea. This recipe looks fantastic! I can’t wait to try it; thank you! Do you think elderberry concentrated juice could be used in place of making the tea? Yes, you may want to cut the recipe in half though, since it would be more concentrated :) The recipe is pretty forgiving as long as you keep the liquid:gelatin ratio the same. 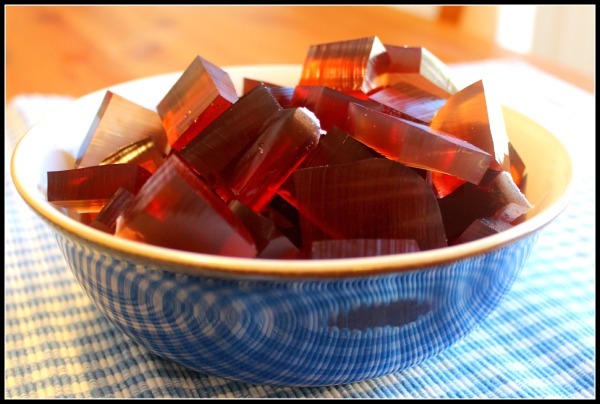 Have you ever used the sambucus (sp) elderberry syrup to add to the gelatin? Since elderberries are not in season and pricey around here I was wondering if I just put that in with the gelatin of that would be comparable. I buy elderberry dried from a company for a really decent price. It is cheaper than buying the syrup. My daughter is allergic to beef & dairy so I can’t use beef gelatin. Do you have an alternative suggestion that works well? It can actually either be used as a jello like gelatin or can be thickened to make gummy bears and such. The consistancy reminds me of sunkist fruit gems. What brand of probiotic do you use? I want my family to use them. I am just not sure what to get. Also, thank you for this awesome recipe. We use Biokult :) So glad you like the recipe! Would vegetarian gelatine work? I can’t get safe animal gelatine where I live. Thank you Heather, I was going to ask about agar agar. I don’t think it will work, but I haven’t tried it :) If you do, please let us know! Agar agar flakes and fruit pectin are not GAPS legal. would you give to a 2 year old? Please let us know how fresh elderberries work with this recipe. Elderberry is efficacious and elderberry trees so abundant that it’s a shame to let the fruit go to waste and spend so much on buying the concentrate. I’d really like some tips on how to make / use / store the fresh juice. You can store fresh elderberries frozen, or freeze the juice. could you make this with Pomona’s pectin instead of gelatin? since you can use honey w/Pomona’s, and it has a better texture? I love this idea (and I love you! ), but I’m sorry to say the result was less than desirable. I thought 1/2 cup of gelatin sounded like a lot, but I went with it anyway. The gummies were like bouncy balls, and no amount of honey, vanilla, or elderberry flavor could cover that horribly strong gelatin taste/smell. I think 2 Tbsp would have been perfectly adequate. Sad to see my honey and great lakes gelatin go to waste, but I’ll play around with the proportions and try something similar. I’m sorry they didn’t work for you! They are much more firm than jell-o, I might need to specify that. They turned out to be about the consistency of gummie bears for me, and I haven’t noticed the gelatin flavor. You should be able to melt them down and add more liquid, though, I would be sad to throw out those ingredients as well! Any suggestions on what to do with the elderberries after making tea? Besides throw them away. What size glass dish? Thanks for the recipe! Does it have to be filtered water? I clicked on the link to buy the grass fed gelatin and it link brought me to a Great Lakes kosher gelatin product on Amazon. Is this the product you use? I went to the companies website and they had no information regarding what the cattle are fed. yes, this is the one I use :) This is in their FAQs : 4. How are the cattle raised? Our cattle are grass fed and slaughtered in Argentina and Brazil which is controlled by their respective Department of Agriculture. These countries have the same type of rigourous tests and inspections as the United States. Beef hides are the only product used to manufacture gelatin in these countries. The link to the dried elderberry syrup isn’t working for me ? Can I use store bought elderberry? I cannot make right now and my little guy won’t take his daily dose. Hoping I can sneak it in with this method. My wife tried to make this recipe and the gummies never formed a gelatin and it stayed liquid. The only difference is that she put this in a metal non-stick cookie sheet. Could that have been the difference? what gelatin did you use? hydrolyzed won’t gel. Might this work with goji berries? My kids drink elderberry syrup enthusiastically, but I think they would love gummies even more. Can’t wait to try this! i had the same problem as Rachel. I followed the recipe exactly,and it was too much gelatin. it is too hard and bouncy not pleasant to eat. :( can yu realy melt it again and add more water? how do you do that?